There are currently 2 billion devices running on Android in the world and probably with the launch of Android Go, Google is planning to influence other 2 million more. 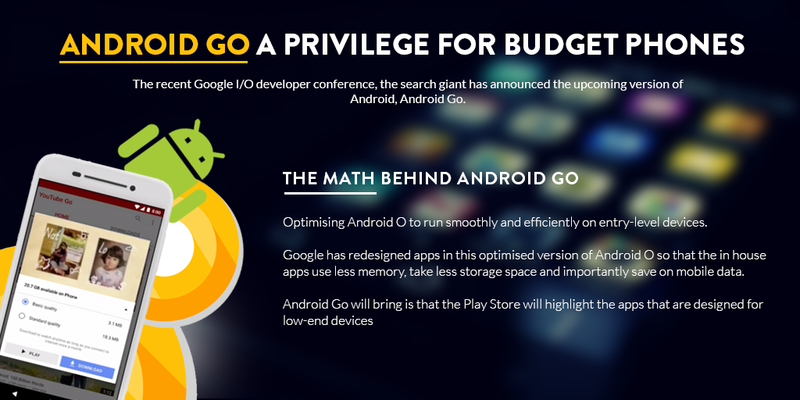 Yes, in the recent Google I/O developer conference, the search giant has announced the upcoming version of Android, Android Go. Google says it is “optimising Android O to run smoothly and efficiently on entry-level devices.” So, yea, Android Go is a mellow down version of Android O and is designed specifically for the phones which don’t pack much RAM and processing power. It is good for phones between 512 MB to 1 GB of RAM. Secondly, Google has redesigned apps in this optimised version of Android O so that the in house apps use less memory, take less storage space and importantly save on mobile data. One example of such an app is YouTube Go. It allows the user to see the preview of the video they want to watch and support the video quality before streaming begins. Perhaps the highlight of this app is that you can download videos to view them later. This feature is available for paid YouTube Red subscribers but now will be a free treat for Android Go phones. Further, devices running on Android Go will have a data management tool in the quick settings, enabling you to use the data rationally. The third important change Android Go will bring is that the Play Store will highlight the apps that are designed for low-end devices. Undoubtedly, users will be able to access the entire app catalogue but the focus will be on those apps which consume less memory, storage space, and saves mobile data. For example, Facebook Lite will be highlighted more than the big, bulky Facebook app. Users can directly check out their data use on notification setting panel. What do you think, how Android Go phone will look like? I feel the Android Go phones would look more like freshly announced Moto C. The phone will run on Android 7.0 Nougat and has all fancy essentials like low-resolution 5-inch screen, 8 GB storage, 5-megapixel fixed-focus camera, and 2-megapixel front camera with flash. In short, a contemporary phone for economical people. The first device toting Android Go won’t come before 2018 but if a lower end device gets updated to Android O then they can enjoy the benefits of Android Go as well. The idea of dominating cheap phones market with Android Go is really smart on the part of Google but how exactly will it sail, only time can show. Will it boost all those devices which support Android and will it suffer the same way as Android One did? Although Google hasn’t announced the hardware yet, obviously if you own a top range Android device, you won’t be able to use Android Go features and those who can’t afford the extravagant phones can really enjoy Android Go more even on tight budgets.